Organix Goodies is partnering with Chessington World of Adventures Resort and its new Gruffalo River Ride Adventure as it splashes into the Wild Woods, to offer little explorers (and mums and dads too) the chance to GO FREE. Thanks to Goodies, everyone’s favourite toddler snacks, little ones can come face to face with the Gruffalo, as they join Mouse on a picturesque riverboat journey through the deep dark wood, with exciting twists and turns along the way. Look out for The Gruffalo promotion on multipacks of your little ones’ favourite Goodies snacks – from tasty oaty, crispy and fruit bars; corn puffs, including the new puffcorn; breadsticks and gingerbread men, farm animal and alphabet biscuits. Each multipack contains a voucher which gives one adult or one child free entry to Chessington World of Adventures Resort. In more good news for visitors to Chessington World of Adventures Resort, for the first time you’ll be able to buy your favourite Goodies snack foods (cheese and herb puffs, oaty bars, gingerbread men, and raisins) and Organix finger foods (carrot sticks and apple rice cakes) at the Resort too. Plus, a couple of Goodies foods will also be part of the Kids’ Meal Deal at Chessington’s Original Sandwich Company and the Coffee Hut. All Organix and Goodies foods come with the Organix No Junk Promise, a stamp of reassurance for parents that they are made with the best organic ingredients and contain nothing unnecessary, so hungry little explorers get great tasting snacks without the junk #SmallWins. 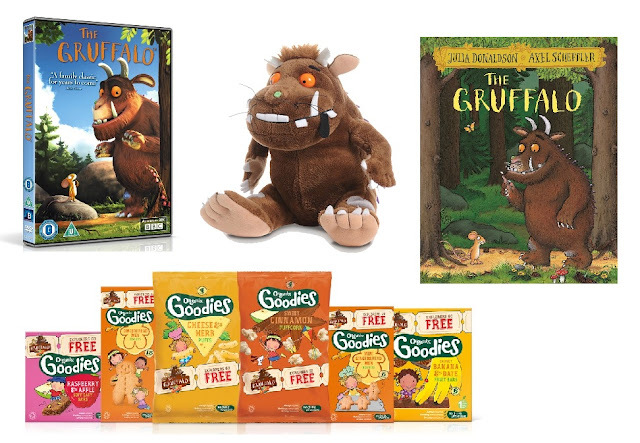 Celebrating its partnership with the new Gruffalo River Ride Adventure at Chessington World of Adventures Resort, Organix are giving a lucky winner the chance to win a Gruffalo DVD, Gruffalo book, Gruffalo plush bear and a £10 bundle of its top selling Goodies healthy snacks. To enter simply use the Gleam form below. Good luck and don't forget to enter my other blog competitions! My kid is obsessed with the Gruffalo. My granddaughter loves the Gruffalo and recently went on a Gruffalo-related geocaching activity which she really enjoyed. I'm sure she'd love the Gruffalo River ride, provided she's big enough to go on it. my little nephew loves the gingerbread men from Organix and I'd love to win this for him! The cheese and herb puffs. Big fans of the animal biscuits here, but they're all yummy. Raspberry & Apple oat bar's my kids love them. The children just love the Gruffalo. the corn puffs and gingerbread men are favs here! The sweetcorn rings are a favourite. We like the carrot sticks and the apple rice cakes. The Mini Gingerbread Men Biscuits! We love the gingerbread men, although my little boy tends to bite heads off and want another! The gingerbread men, they're not as sugary as others and the kids love them - I sneak a few too!!! The cheese crackers, though I've yet to get any of their sweeter treats; I'm sure they'll be an even bigger hit! Which snack from Organix Goodies is your favourite? We love the Cheese and Herb Puffs. My kids love the Gingerbread Men! The children most enjoy the delicious little gingerbread snacks. Love the Raspberry and Apple oat bars! we've always loved their gingerbread men. Raspberry and Apple Oat Bars are our favourite. Ooo we don't have a favourite, But if we had to choose it would be the oaty bars! we love the carrot sticks for a savoury snack! Any of the oat bars are all firm favourites in this house! Raspberry and Apple, very tasty. Me and my little granddaughter love the cheese and herb puffs but she doesn't like to share them with me! She is absolutely obsessed with the gruffalo, we often take her on the gruffly trail in Cannock Chase, she loves it! The gingerbread men are gorgeous. What a fantastic prize! I would love to win this! I love the Gruffalo! I've not tried Organix Goodies before but I think the whole family would enjoy the banana puffcorn. the gingerbread men! he loves them! Our favourite snack from Organix Goodies are the carrot cake soft oaty bars! The mini gingerbread men are much loved.